BARANI DESIGN Technologies and Comptus Inc. of USA strategic partnership announced. MeteoShield Professional will be soon available in a Made-in-USA version. MeteoHelix IoT Pro micro weather stations will soon be available in Assembled-in-USA LoRaWAN and Sigfox version with NB-IoT to follow. Comptus Inc. will become a USA & worldwide distributor and integrator of BARANI DESIGN anemometers, weather stations and sensors. BARANI DESIGN will become a worldwide distributor of the A75-101 & A75-104 anemometer and A75-302 wind direction vane, the direct equivalents of the well known NRG #40 anemometer and NRG #200 wind vane. These products were also sold through Second Wind and Vaisala as the C3 anemometer and PV1 wind vane. In a technology sharing program, both companies will join forces to develop a low-cost wireless precision wind measurement solution to complement the MeteoHelix IoT Pro wireless weather stations and to directly compete in the high-end and middle market segments in agricultural weather station applications. The MeteoHelix and MeteoWind Compact combination will become the only affordably priced weather station solution to meet the Wold Meteorological Organization (WMO) measurement standards. This meteorological sensor solution is aimed at putting precision back into precision agriculture which is currently being dominated by measurement equipment not conforming to worldwide measurement standards. What is a Vandalism-Tolerant Meteorological Network? MeteoHelix agricultural weather station overlooking crop field experiments in a vandalism prone area. A high-density meteorological network based on affordable WMO conforming micro weather stations is inherently vandalism-proof. Larger data density allows the network to absorb a large number of end-point weather station vandalism failures while maintaining sufficient data density. Redundancy of wireless data coverage based on IoT technologies affords the network even more reliability. Combined with a micro weather station designed to prevent data access to thieves and with minimal resale or recyclable material value, this will de-incentivize serial vandals and thieves. What weather station was designed from the onset for vandalism tolerant meteorological networks? MeteoHelix IoT Pro micro weather stations are designed to for vandalism tolerant meteorological applications requiring the utmost precision of measurement per World Meteorological Organization WMO standards. Independent wind sensor apart from the temperature, humidity, atmospheric pressure and sun sensors create a modular system able to conform to all use cases and needs. 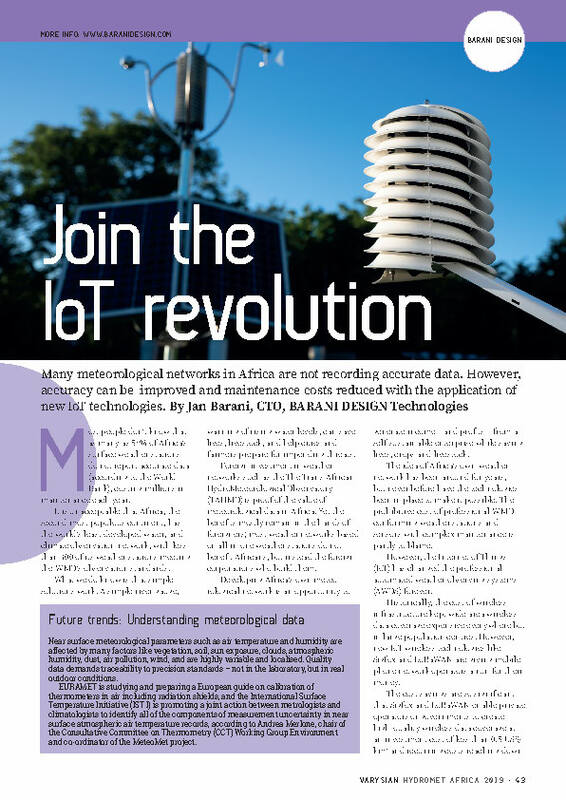 Excerpt was taken from “Join the IoT Revolution” article on page 43 of the Hydromet AFRICA ExpoGuide as published by Varysian. This article is based on the 10+ years of experience in the meteorological industry of Jan Barani, who is the designer of the only WMO conforming micro-weather station, the MeteoHelix IoT Pro.